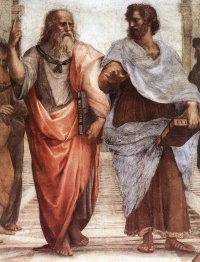 This page lists some links to ancient philosophy. In Europe, the spread of Christianity through the Roman world marked the end of Hellenistic philosophy and ushered in the beginnings of Medieval philosophy. While there are ancient relations between the Indian Vedas and the Iranian Avesta, the two main families of the Indo-Iranian philosophical traditions were characterized by fundamental differences in their implications for the human being's position in society and their view on the role of man in the universe. The first charter of human rights by Cyrus the Great is widely seen as a reflection of the questions and thoughts expressed by Zarathustra and developed in Zoroastrian schools of thought. In China, less emphasis was put upon materialism as a basis for reflecting upon the world and more emphasis was put on conduct, manners and social behaviour, as evidenced by Taoism and Confucianism. Unless indicated otherwise, the text in this article is either based on Wikipedia article "Ancient philosophy" or another language Wikipedia page thereof used under the terms of the GNU Free Documentation License; or on original research by Jahsonic and friends. See Art and Popular Culture's copyright notice. This page was last modified 19:24, 25 April 2013.